Now that Valentine’s Day is over, do you feel like you’ve capitalized on the holiday, or do you think you could have strategized better and come out of the holiday more profitable? Seasonal advertising takes a great deal of planning in order to be successful, but more importantly it requires a deeper understanding of consumer behavior and purchasing trends. 1. Research consumer shopping trends months in advance. In our industry, it’s always important to keep abreast of not only trends within the affiliate marketing industry, but also to understand consumer trends and purchasing habits. For example, home improvement products and services experience a boom in the spring because of “spring cleaning.” And just because you may not be in college anymore doesn’t mean you can ignore the fact that millions of college students around the country are going on exotic spring break vacations, making the month of March one of the busiest travel times throughout the year. Putting the time in to research consumer purchasing trends throughout the year and understanding when certain products and services experience highs and lows will help your bottom line. 2. Map out these holidays on a calendar and come up with a marketing plan of attack. Mapping out important holidays and consumer trends on a calendar will allow you to get a head start on your spring marketing, ensuring a successful start to your marketing plan. Affiliate marketers are very careful with their budgets, but it’s important to spend your money in the right place. If you plan out your marketing budget across the season in advance, you won’t end up low on funds later on in any of the key areas you’re planning to target. 3. 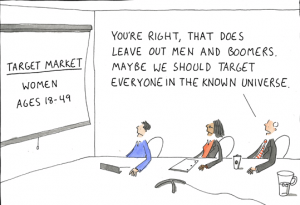 Segment and identify your target audience(s) & demographic. Different trends attract different groups of people, so it’s important to determine who your target audiences are before you begin marketing. This includes identifying your target age, gender, race, socioeconomic background, geographic region, occupation, religion, etc for every product or service you’re marketing. Certain traffic types are also conducive to certain demographics as well, and most ad networks allow affiliates to target as broad or narrow as they would like. 4. Find out which promotion methods your competitors will be using. Let’s face it. Many of us in this industry are friends on Facebook and LinkedIn, and we all frequent the same forums and affiliate marketing newsletters. Knowing your competition and their approach is important, whether you’re an affiliate, an advertiser or an affiliate manager. While keeping up with your competition is essential, it’s even more important to be creative and find a way to set yourself apart from the competition. We’re in an industry that values creativity over almost anything else, but it still often appears that many people become complacent and keep to the status quo. Push the envelope with your landing pages, creatives and ad copy, suggest new subject lines and brainstorm options that will give you the edge over your competitors. 5. Be flexible and keep testing! Once you’re in the action stage of your marketing plan, it’s equally as important to be flexible and able to tweak and change things that may not be working. If you’re an affiliate, communication with your AM is essential because they have a bird’s eye view of the industry. If something is not working for you, there’s probably an alternate approach or some modification that your affiliate manager can recommend based on what they have seen to be successful. Testing is always one of the most important parts of this process – testing new offers, new creatives or new ad copy. Never get frustrated if something is not working for you, because that’s part of the learning process. The most successful accomplishments are often obtained through those learning experiences. Meredith Reilly graduated from the University of Miami (FL) with a Bachelor degree in Media Management and Economics. As an Affiliate Strategist and experienced member of the Clickbooth Publishing team, Meredith specializes in media buying and social traffic. In her free time, she plays 3rd base for the Clickbooth kickball team, the CB Kick Ballazzzz. Information overload seems to be a stumble block, as a result I can’t see the light at the end of the tunnel. Any suggestions? Hi there! Very nice article with useful tips and suggestions. I am new to this and feel like Ashley at this moment – toally overwhelmed.